Innovation and the effective protection of intellectual property (IP) rights are vital to the economic health of communities across our country. This is especially so in the Midwest where, as regional director of the USPTO’s Elijah J. McCoy Midwest Regional Office in Detroit, I see the output of American entrepreneurs and inventors, and work with them to protect their valuable IP. As the USPTO’s newest regional director, I am making my way across the Midwest to engage with our key stakeholders, who include small business owners, independent inventors, entrepreneurs, and local officials, among others. In December, I met with various business groups and IP stakeholders when I joined several of the USPTO’s IP attachés as they conducted a series of outreach activities in the Chicago area. The IP attachés — who are diplomats currently posted to 10 U.S. embassies and consulates throughout the world — work to improve IP systems internationally to benefit U.S. stakeholders. They do this by working with foreign officials to address a wide variety of IP-related issues that arise in their respective regions, and by offering assistance to U.S. companies who encounter problems protecting their IP rights. Each year, the IP attachés travel home to the United States, as part of their ongoing effort both to learn about the concerns of inventors and businesses and to make them more aware of the international aspects of IP protection and the role of the IP attachés. In December, Chicago was one of their destinations, and I joined the attachés when they visited business incubator mHUB. 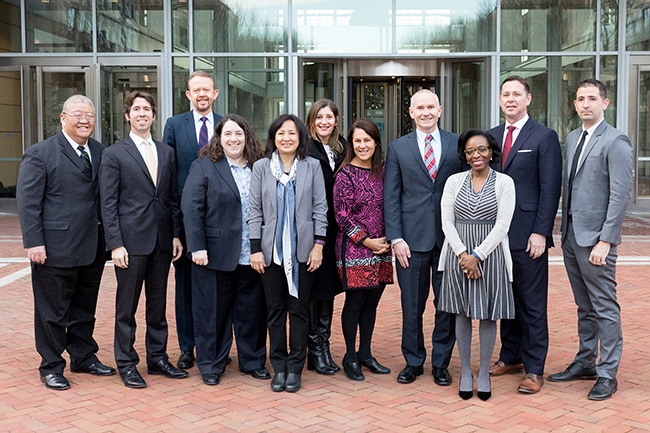 The USPTO’s IP attachés during their visit to the United States in December 2018. Photo by Jay Premack/USPTO. Located at a former Motorola Mobility prototyping center, mHUB opened its doors in 2017 with help from private industry and the city of Chicago. It brings together a unique co-working community of product designers, developers, entrepreneurs, engineers, and manufacturers. One of the highlights of our visit was a presentation the IP attachés gave on the basics of protecting and enforcing one’s creations and inventions abroad, and a follow-up discussion which I joined regarding various aspects of innovation. Damian Porcari, Director of the USPTO’s Elijah J. McCoy Midwest Regional Office in Detroit, speaks at the Chicago incubator, mHUB, during a visit he and several of the USPTO’s IP attachés made to the facility on December 4, 2018. It was gratifying to hear that during its relatively short time in existence mHUB has already helped a number of companies achieve success. These include such innovators as Cast21, a developer of unique bone-mending aids that can replace casts; OrbitMuse, a platform for space entrepreneurship; and Guardhat, a smart hard-hat designed to protect workers in factories, plants, construction sites, oil rigs, and mines. The importance of IP to small innovative firms such as these cannot be understated: There is a large body of research showing that startup firms with patents, for example, are likelier to continue receiving venture capital funding, experience greater growth in employment and investor returns, and have a higher rate of firm survival. Our visit to mHUB underlined the critical role that the USPTO plays in supporting the efforts of these innovative startups, by helping them protect their valuable IP both here and abroad. Learn more about the USPTO’s IP Attaché Program.